ATLANTA: AT&T is using social media and partnerships with entertainment companies and artists to interact with a younger demographic. ATLANTA: AT&T is using social media and partnerships with entertainment companies and artists to interact with a younger demographic. The latest of these partnerships, with rapper Lil' Wayne, saw the company introducing his latest single via social media. "The youth segment is a really key segment, and we want to reach as much of that audience as possible," said Mark Nagel, director of music and video production for AT&T. "[Social media] is really the perfect match to reach those customers in a place that is really relevant." AT&T worked with Lil' Wayne and his label, Cash Money/Universal Motown Records, to stream the debut performance of his new single, "Prom Queen," on AT&T's Freedom of Choice and Mobile Music Facebook pages on January 27. "It's a way for AT&T to differentiate and connect with different customers," Nagel said, about the goal of the program. On the label side, the buzz from AT&T helps sell content. Leading up to the performance, AT&T worked with the record label to promote the campaign, sending e-mails and text messages to fans and working with fan Web sites. 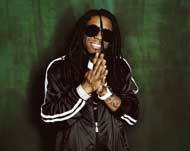 The choice to use Lil'Wayne's music for the promotion was not arbitrary. AT&T data shows that its customers downloaded his ringtones more often than any other artist in 2008. "[We want to] engage younger customers to find relevance with our brand," added Mimi Chan, director of national marketing for AT&T. "We want to resonate with them, so they know we have the best music, texting." Through Facebook, AT&T was "able to drive a large number of customers to gain awareness of the campaign," she said. Fleishman-Hillard, AT&T's communications AOR, supported the program with digital and communications initiatives and helped the company reach out to music publications, general consumer publications, as well as online publications and bloggers.